To solve real-world problems using emerging abilities in synthetic biology, research must focus on a few ambitious goals, argues Dan Fletcher, Professor of bioengineering and biophysics, and chair of the Department of Bioengineering at the University of California, Berkeley, USA. He is also a Chan Zuckerberg Biohub Investigator. 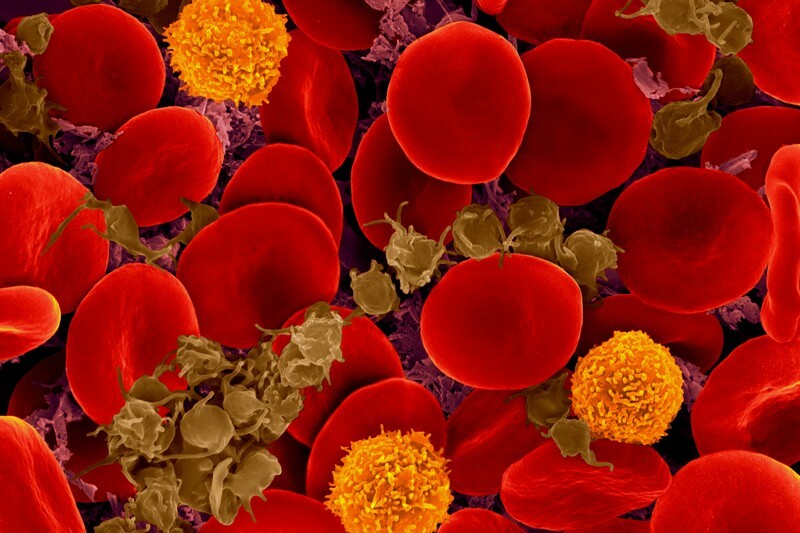 Artificial blood cells. Blood transfusions are crucial in treatments for everything from transplant surgery and cardiovascular procedures to car accidents, pregnancy-related complications and childhood malaria (see go.nature.com/2ozbfwt). In the United States alone, 36,000 units of red blood cells and 7,000 units of platelets are needed every day (see go.nature.com/2ycr2wo). But maintaining an adequate supply of blood from voluntary donors can be challenging, especially in low- and middle-income countries. To complicate matters, blood from donors must be checked extensively to prevent the spread of infectious diseases, and can be kept for only a limited time — 42 days or 5 days for platelets alone. What if blood cells could be assembled from purified or synthesized components on demand? In principle, cell-like compartments could be made that have the oxygen-carrying capacity of red blood cells or the clotting ability of platelets. The compartments would need to be built with molecules on their surfaces to protect the compartments from the immune system, resembling those on a normal blood cell. Other surface molecules would be needed to detect signals and trigger a response. In the case of artificial platelets, that signal might be the protein collagen, to which circulating platelets are exposed when a blood vessel ruptures5. Such compartments would also need to be able to release certain molecules, such as factor V or the von Willebrand clotting factor. This could happen by building in a rudimentary form of exocytosis, for example, whereby a membrane-bound sac containing the molecule would be released by fusing with the compartment’s outer membrane. It is already possible to encapsulate cytoplasmic components from living cells in membrane compartments6,7. Now a major challenge is developing ways to insert desired protein receptors into the lipid membrane8, along with reconstituting receptor signalling. Red blood cells and platelets are good candidates for the first functionally useful synthetic cellular system because they lack nuclei. Complex functions such as nuclear transport, protein synthesis and protein trafficking wouldn’t have to be replicated. If successful, we might look back with horror on the current practice of bleeding one person to treat another. Designer immune cells. Immunotherapy is currently offering new hope for people with cancer by shaping how the immune system responds to tumours. Cancer cells often turn off the immune response that would otherwise destroy them. The use of therapeutic antibodies to stop this process has drastically increased survival rates for people with multiple cancers, including those of the skin, blood and lung9. Similarly successful is the technique of adoptive T-cell transfer. In this, a patient’s T cells or those of a donor are engineered to express a receptor that targets a protein (antigen) on the surface of tumour cells, resulting in the T cells killing the cancerous cells (called CAR-T therapies)10. All of this has opened the door to cleverly rewiring the downstream signalling that results in the destruction of tumour cells by white blood cells11. What if researchers went a step further and tried to create synthetic cells capable of moving towards, binding to and eliminating tumour cells? In principle, untethered from evolutionary pressures, such cells could be designed to accomplish all sorts of tasks — from killing specific tumour cells and pathogens to removing brain amyloid plaques or cholesterol deposits. If mass production of artificial immune cells were possible, it might even lessen the need to tailor treatments to individuals — cutting costs and increasing accessibility. Researchers have already made cell-like compartments that can change shape12, and have installed signalling circuits within them13. These could eventually be used to control movement and mediate responses to external signals. Smart delivery vehicles. The relative ease of exposing cells in the lab to drugs, as well as introducing new proteins and engineering genomes, belies how hard it is to deliver molecules to specific locations inside living organisms. One of the biggest challenges in most therapies is getting molecules to the right place in the right cell at the right time. Harnessing the natural proclivity of viruses to deliver DNA and RNA molecules into cells has been successful14. But virus size limits cargo size, and viruses don’t necessarily infect the cell types researchers and clinicians are aiming at. Antibody-targeted synthetic vesicles have improved the delivery of drugs to some tumours. But getting the drug close to the tumour generally depends on the vesicles leaking from the patient’s circulatory system, so results have been mixed. Could ‘smart’ delivery vehicles containing therapeutic cargo be designed to sense where they are in the body and move the cargo to where it needs to go, such as across the blood–brain barrier? This has long been a dream of those in drug delivery. The challenges are similar to those of constructing artificial blood and immune cells: encapsulating defined components in a membrane, incorporating receptors into that membrane, and designing signal-processing systems to control movement and trigger release of the vehicle’s contents. The development of immune-cell ‘backpacks’ is an exciting step in the right direction. In this, particles containing therapeutic molecules are tethered to immune cells, exploiting the motility and targeting ability of the cells to carry the molecules to particular locations15. A minimal chassis for expression. In each of the previous examples, the engineered cell-like system could conceivably be built to function over hours or days, without the need for additional protein production and regulation through gene expression. For many other tasks, however, such as the continuous production of insulin in the body, it will be crucial to have the ability to express proteins, upregulate or downregulate certain genes, and carry out functions for longer periods. Engineering a ‘minimal chassis’ that is capable of sustained gene expression and functional homeostasis would be an invaluable starting point for building synthetic cells that produce proteins, form tissues and remain viable for months to years. This would require detailed understanding and incorporation of metabolic pathways, trafficking systems and nuclear import and export — an admittedly tall order. It is already possible to synthesize DNA in the lab, whether through chemically reacting bases or using biological enzymes or large-scale assembly in a cell16. But we do not yet know how to ‘boot up’ DNA and turn a synthetic genome into a functional system in the absence of a live cell. Since the early 2000s, biologists have achieved gene expression in synthetic compartments loaded with cytoplasmic extract17. And genetic circuits of increasing complexity (in which the expression of one protein results in the production or degradation of another) are now the subject of extensive research. Still to be accomplished are: long-lived gene expression, basic protein trafficking and energy production reminiscent of live cells. 372/3:15 Genetic influence on LpPLA2 activity at baseline as evaluated in the exome chip-enriched GWAS study among ~13600 patients with chronic coronary artery disease in the STABILITY (STabilisation of Atherosclerotic plaque By Initiation of darapLadIb TherapY) trial. L. Warren, L. Li, D. Fraser, J. Aponte, A. Yeo, R. Davies, C. Macphee, L. Hegg, L. Tarka, C. Held, R. Stewart, L. Wallentin, H. White, M. Nelson, D. Waterworth. Genetic influence on LpPLA2 activity at baseline as evaluated in the exome chip-enrichedGWASstudy among ~13600 patients with chronic coronary artery disease in the STABILITY (STabilisation of Atherosclerotic plaque By Initiation of darapLadIb TherapY) trial. L. Tarka3, C. Held4, R. Stewart5, L. Wallentin4, H. White5, M. Nelson1, D.
5) 5Green Lane Cardiovascular Service, Auckland Cty Hospital, Auckland, New Zealand. STABILITY is an ongoing phase III cardiovascular outcomes study that compares the effects of darapladib enteric coated (EC) tablets, 160 mg versus placebo, when added to the standard of care, on the incidence of major adverse cardiovascular events (MACE) in subjects with chronic coronary heart disease (CHD). Blood samples for determination of the LpPLA2 activity level in plasma and for extraction of DNA was obtained at randomization. To identify genetic variants that may predict response to darapladib, we genotyped ~900K common and low frequency coding variations using Illumina OmniExpress GWAS plus exome chip in advance of study completion. Among the 15828 Intent-to-Treat recruited subjects, 13674 (86%) provided informed consent for genetic analysis. Our pharmacogenetic (PGx) analysis group is comprised of subjects from 39 countries on five continents, including 10139 Whites of European heritage, 1682 Asians of East Asian or Japanese heritage, 414 Asians of Central/South Asian heritage, 268 Blacks, 1027 Hispanics and 144 others. Here we report association analysis of baseline levels of LpPLA2 to support future PGx analysis of drug response post trial completion. Among the 911375 variants genotyped, 213540 (23%) were rare (MAF < 0.5%). Our analyses were focused on the drug target, LpPLA2 enzyme activity measured at baseline. GWAS analysis of LpPLA2 activity adjusting for age, gender and top 20 principle component scores identified 58 variants surpassing GWAS-significant threshold (5e-08). Genome-wide stepwise regression analyses identified multiple independent associations from PLA2G7, CELSR2, APOB, KIF6, and APOE, reflecting the dependency of LpPLA2 on LDL-cholesterol levels. Most notably, several low frequency and rare coding variants in PLA2G7 were identified to be strongly associated with LpPLA2 activity. They are V279F (MAF=1.0%, P= 1.7e-108), a previously known association, and four novel associations due to I1317N (MAF=0.05%, P=4.9e-8), Q287X (MAF=0.05%, P=1.6e-7), T278M (MAF=0.02%, P=7.6e-5) and L389S (MAF=0.04%, P=4.3e-4). All these variants had enzyme activity lowering effects and each appeared to be specific to certain ethnicity. Our comprehensive PGx analyses of baseline data has already provided great insight into common and rare coding genetic variants associated with drug target and related traits and this knowledge will be invaluable in facilitating future PGx investigation of darapladib response. What is the Genetic Base of Atherosclerosis and Loss of Arterial Elasticity with Aging? APOC3 is involved in fat metabolism and may delay the catabolism of triglyceride-rich particles. Changes in APOC3 expression levels have been reported in aged mice . Results from mice suggest that FOXO1 may regulate the expression of APOC3 . Polymorphisms in the human APOC3 gene and promoter have been associated with lipoprotein profile, cardiovascular health, insulin (INS) sensitivity, and longevity . Therefore, APOC3 may impact on some age-related diseases, though its exact role in human ageing remains to be determined. Apolipoprotein C-III is a protein component of very low density lipoprotein (VLDL). APOC3 inhibitslipoprotein lipase and hepatic lipase; it is thought to inhibit hepatic uptake of triglyceride-rich particles. The APOA1, APOC3 and APOA4 genes are closely linked in both rat and human genomes. The A-I and A-IV genes are transcribed from the same strand, while the A-1 and C-III genes are convergently transcribed. An increase in apoC-III levels induces the development of hypertriglyceridemia. Two novel susceptibility haplotypes (specifically, P2-S2-X1 and P1-S2-X1) have been discovered in ApoAI-CIII-AIV gene cluster on chromosome 11q23; these confer approximately threefold higher risk ofcoronary heart disease in normal as well as non-insulin diabetes mellitus.Apo-CIII delays the catabolism of triglyceride rich particles. Elevations of Apo-CIII found in genetic variation studies may predispose patients to non-alcoholic fatty liver disease. ^ Mendivil CO, Zheng C, Furtado J, Lel J, Sacks FM (2009). “Metabolism of VLDL and LDL containing apolipoprotein C-III and not other small apolipoproteins – R2”.Arteriosclerosis, Thrombosis and Vascular Biology 30 (2): 239–45. doi:10.1161/ATVBAHA.109.197830. PMC 2818784. PMID 19910636. ^ Singh PP, Singh M, Kaur TP, Grewal SS (2007). “A novel haplotype in ApoAI-CIII-AIV gene region is detrimental to Northwest Indians with coronary heart disease”. Int J Cardiol 130 (3): e93–5. doi:10.1016/j.ijcard.2007.07.029. PMID 17825930. ^ Singh PP, Singh M, Gaur S, Grewal SS (2007). “The ApoAI-CIII-AIV gene cluster and its relation to lipid levels in type 2 diabetes mellitus and coronary heart disease: determination of a novel susceptible haplotype”. Diab Vasc Dis Res 4 (2): 124–29. doi:10.3132/dvdr.2007.030. PMID 17654446. We determined genomewide associations with the presence of aortic-valve calcification (among 6942 participants) and mitral annular calcification (among 3795 participants), as detected by computed tomographic (CT) scanning; the study population for this analysis included persons of white European ancestry from three cohorts participating in the Cohorts for Heart and Aging Research in Genomic Epidemiology consortium (discovery population). Findings were replicated in independent cohorts of persons with either CT-detected valvular calcification or clinical aortic stenosis. We present below the MARKET LEADER in Interpretation of the Genomics Computations Results in the emerging new ERA of Medicine: Genomic Medicine, Knome.com and its home grown software power house. Remember a couple of years ago when people commemorated the 10-year anniversary of the first draft human genome sequencing? The storyline then, in 200, was that we all went off to genome camp and only came home with a lousy T-shirt. Society, we were told, invested huge scientific resources in deciphering the code of life, and there wasn’t much of a payoff in the form of customized, personalized medicine. CAMBRIDGE, MA – May 6, 2013 – Knome Inc., the genome interpretation company, and Real Time Genomics, Inc., the genome analytics company, today announced that the Real Time Genomics (RTG) Variant platform will be integrated into every shipment of the knoSYS™100 interpretation system. The agreement enables customers to easily purchase the RTG analytics engine as an upgrade to the system. The product will combine two world-class commercial platforms to deliver end-to-end genome analytics and interpretation with superior accuracy and speed. Financial terms of the agreement were not disclosed. Knome Inc. (www.knome.com) is a leading provider of human genome interpretation systems and services. We help clients in two dozen countries identify the genetic basis of disease, tumor growth, and drug response. Designed to accelerate and industrialize the process of interpreting whole genomes, Knome’s big data technologies are helping to pave the healthcare industry’s transition to molecular-based, precision medicine. Real Time Genomics (www.realtimegenomics.com) has a passion for genomics. The company offers software tools and applications for the extraction of unique value from genomes. Its competency lies in applying the combination of its patented core technology and deep computational expertise in algorithms to solve problems in next generation genomic analysis. Real Time Genomics is a private San Francisco based company backed by investment from Catamount Ventures, Lightspeed Venture Partners, and GeneValue Ltd.
…Cambridge, Massachusetts–based Knome made one of the splashiest entries into the field, but has now turned entirely to contract research. The company began providing DTC whole-genome sequencing to independently wealthy individuals at a time when the price was still sky high. The company’s first client, Dan Stoicescu, was a former biotech entrepreneur who paid $350,000 to have his genome sequenced in 2008 so he could review it “like a stock portfolio” as new genetic discoveries unfolded4. About a year later, the company was auctioning off a genome, with such frills as a dinner with renowned Harvard genomics researcher George Church, at a starting price of $68,000; at the time, a full-genome sequence came at the price of $99,000, indicating that the cost of genome sequencing has been plummeting steadily. Now, the company’s model is very different. “We stopped working with the ‘wealthy healthy’ in 2010,” says Jonas Lee, Knome’s chief marketing officer. “The model changed as sequencing changed.” The new emphasis, he says, is now on using Knome’s technology and technical expertise for genome interpretation. Knome’s customers are researchers, pharmaceutical companies and medical institutions, such as Johns Hopkins University School of Medicine in Baltimore, which in January signed the company up to interpret 1,000 genomes for a study of genetic variants underlying asthma in African American and African Caribbean populations. Knome is trying to advance the clinical use of genomics, working with groups that “want to be prepared for what’s ahead,” Lee says. “We work with at least 50 academic institutions and 20 pharmaceutical companies looking at variants and drug response.” Cancer and idiopathic genetic diseases are the first sweet spots for genomic sequencing, he says. Although cancer genomics has been hot for a while, a recent string of discoveries of Mendelian diseases5 made by whole-genome sequencing has lit up that field, too. Lee is also confident, however, that “chronic diseases like heart disease are right behind those.” The company also provides software tools. The price for its KnomeDiscovery sequencing and analysis service starts at about $12,000 per sample–read the entire article here. The knoSYS™100 ships with knoSOFT, an advanced application for managing sequence data through the informatics pipeline, filtering variants, running gene panels, classifying/interpreting variants, and reporting results. knoSOFT has powerful and scalable multi-sample comparison features–capable of performing family studies, tumor/normal studies, and large case-control comparisons of hundreds of whole genomes. Multiple simultaneous users (10) are supported, including technicians running sequence data through informatics pipeline, developers creating next-generation gene panels, geneticists researching causal variants, and production staff processing gene panels. View our collection of journal articles and genome research papers written by Knome employees, Knome board members, and other industry experts. Lustre array: Two 12x4TB arrays of 12 3.5″ drives with 6GB/sec serial SATA channels, each OSS powered by a 6-core Intel Xeon 64-bit processor running at 20GHz with 32GB RAM. 96TB total, 64TB useable storage (redundancy for failure tolerance). Expandable 384TB total. Our research services group uses a set of advanced software tools designed for whole genome and exome interpretation. These tools are also available to our clients through our knomeBASE informatics service. In addition to various scripts, libraries, and conversion utilities, these tools include knomeVARIANTS and knomePATHWAYS. knome VARIANTS is a query kit that lets users search for candidate causal variants in studied genomes. It includes a query interface (see above), scripting libraries, and data conversion utilities. Users select cases and controls, input a putative inheritance mode, and add sensible filter criteria (variant functional class, rarity/novelty, location in prior candidate regions, etc.) to automatically generate a sorted short-list of leading candidates. The application includes a SQL query interface to let users query the database as they wish, including by complex or novel sets of criteria. knomePATHWAYS is a visualization tool that overlays variants found in each sample genome onto known gene interaction networks in order to help spot functional interactions between variants in distinct genes, and pathways enriched for variants in cases versus controls, differential drug responder groups, etc. knomePATHWAYS integrates reference data from many sources, including GO, HPRD, and MsigDB (which includes KEGG and Reactome data). The application is particularly helpful in addressing higher-order questions, such as finding candidate genes and protein pathways, that are not readily addressed from tabular annotation data alone. Clinicians can get a “simultaneous consult” about their patient’s diagnosis using SimulConsult’s diagnostic decision support software. Using the free “phenome” version, medical professionals can enter patient findings into the software and get an initial differential diagnosis and suggestions about other useful findings, including tests. The database used by the software has > 4,000 diagnoses, most complete for genetics and neurology. It includes all genes in GeneTests and all diseases in GeneReviews. The information about diseases is entered by clinicians, referenced to the literature and peer-reviewed by experts. The software takes into account pertinent negatives, temporal information, and cost of tests, information ignored in other diagnostic approaches. It transforms medical diagnosis by lowering costs, reducing errors and eliminating the medical diagnostic odysseys experienced by far too many patients and their families. Using the “genome-phenome analyzer” version, a lab can combine a genome variant table with the phenotypic data entered by the referring clinician, thereby using the full power of genome + phenome to arrive at a diagnosis in seconds. An innovative measure of pertinence of genes focuses attention on the genes accounting for the clinical picture, even if more than one gene is involved. The referring clinician can use the results in the free phenome version of the software, for example adding information from confirmatory tests or adding new findings that develop over time. For details, click here. Michael M. Segal MD, PhD, Founder,Chairman and Chief Scientist. Dr. Segal did his undergraduate work at Harvard and his MD and PhD at Columbia, where his thesis project outlined rules for the types of chemical synapses that will form in a nervous system. After his residency in pediatric neurology at Columbia, he moved to Harvard Medical School, where he joined the faculty and developed the microisland system for studying small numbers of brain neurons in culture. Using this system, he developed a simplified model of epilepsy, work that won him national and international young investigator awards, and set the stage for later work on the molecular mechanism of attention deficit disorder. Dr. Segal has a long history of interest in computers, and patterned the SimulConsult software after the way that experienced clinicians actually think about diagnosis. He is on the Electronic Communication Committee of the Child Neurology Society and the Scientific Program Committee of the American Medical Informatics Association. This is very interesting work that Knome is doing and I liked how you tied in ApoCIII variants and risk of heart disease. 1) I wonder why also the link with diabetes mellitus and 2) I wonder if ApoIIIC is being looked at as a target (targeting the variants). It is interesting that a link is made not only with exome region variants but variants within the promoter region. It is great work by Knome to organize all these variants into a map however, I believe, we will still, as a scientific community, do the due diligence on each of these linkages. It took many years of hard work, debate, and research before the cancer community was fully convinced of BRCA1/2 and is even harder convincing the insurance companies (I loved the story about the graduate student who sequenced his own tumor and fought the insurance company). Thank you for the comments above. As the new field of biocuration expands into disease states I think it will be important to create a table or listing of the different services like Knome or KEGG or GO functional analysis as well as systems like REACTome databases. Integration needs to be simplified and seemless for the clinician to make a good diagnosis and determine a strategy based on genomics. As of know we have multitude of databases and much work is being done using these databases as training sets for data mining and text mining programs. I agree regarding the integration of DBs. Kaiser Permanente in CA, is leading the way in terms of launching a program of having genomics data on each patient under their care and offering a la carte medical services per genomics profile. A different approach is taken by Partners in MA. Please search partners in our Journal and read it and the section on genomics in Harvard Medical School.